MicroBlaster or AccuFlo - How Do You Choose a Blaster? MicroBlaster or AccuFlo – How Do You Choose? A customer sent in their older MicroBlaster® for routine maintenance last week. We built and shipped this MB100 model in 1978 to this same customer. That’s right: this MicroBlaster is just shy of 40 years old and still humming along in mint condition. A 1978 MB100 model MicroBlaster kept in excellent condition and still in use. Abrasive rushing through any system at high velocities does a good bit of damage to all in its wake. This blaster’s longevity is a testament to the TLC it received, and if we can toot our horns for a moment, the blaster design and construction. endured long hours of use by multiple operators. 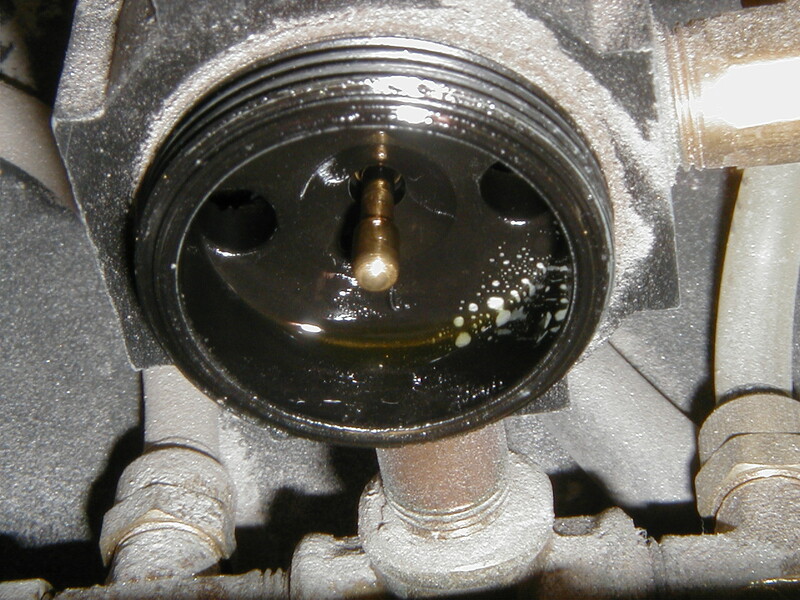 suffered oil and moisture contamination. looked corroded, worn down and patched together. Let’s say after 38 years of heavy use and abuse, it is time to retire this MicroBlaster to a sunny spot where it can work on its golf swing and enjoy long leisurely dinners. What’s Next for This Customer: MicroBlaster or AccuFlo? What might our Sales Team recommend to this hypothetical customer who needs to replace their hypothetically exhausted MB100? Given the long life of their MB100, a simple swap out for a newer model of the classic MicroBlaster seems the likeliest option, right? This customer needs a system that can endure long hours of use; so the blaster with fewer and more durable wear points is a better option. Multiple operators use this blaster; so the customer could really benefit from a clear and simple method for tracking maintenance. 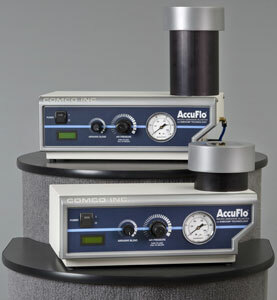 The AccuFlo® is now the best option for most MicroBlasting applications. There are exceptions, and we will look at a few later. 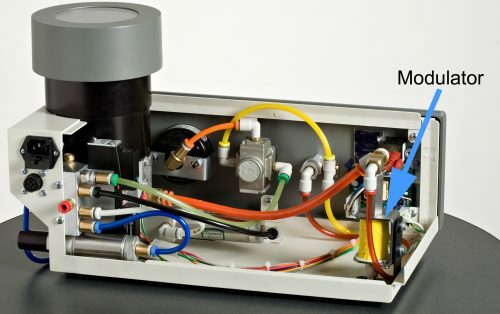 The AccuFlo is the latest edition of our MicroBlaster, evolving from the proven design and tradition of excellence that built the MB100 in 1978. The AccuFlo is stronger, faster, more consistent and more efficient than all of our previous MicroBlaster models; so, we gave it a name to reflect its capabilities. How Is the AccuFlo an Improvement on the Classic MicroBlaster? 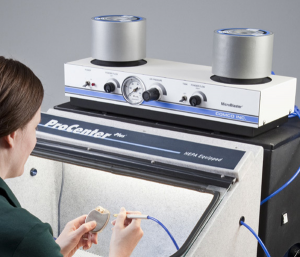 delivers a stronger pulse of air into the mixing chamber, fluidizing the abrasive better. Our patented PowderGate® valve lasts about 250,000 blast cycles; whereas the traditional pinch valve used on most MicroBlasters lasts at most 10,000 cycles. 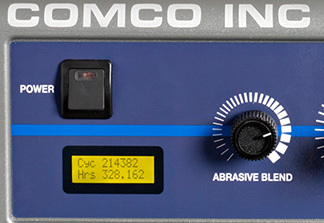 The media tank features a clear cover for easy abrasive monitoring and a new thread design for quick, friction-reducing removal. 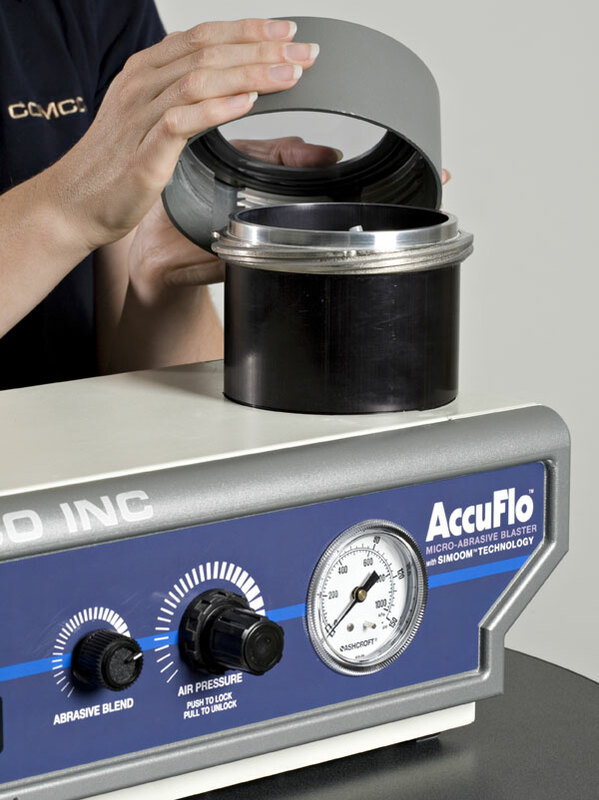 The AccuFlo’s media tank holds 50% more abrasive than a classic MicroBlaster’s tank, and it can handle a wider range of types and sizes of abrasive. 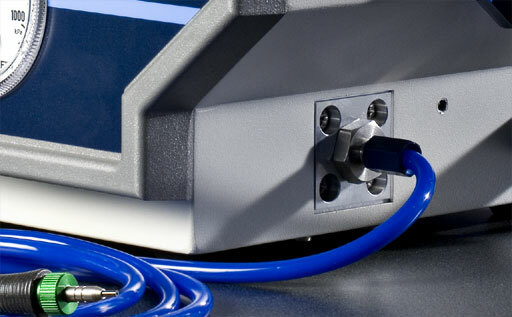 All wear points are easily accessible in the AccuFlo’s open design. All internal fittings are one-touch. Air lines and fittings are color-coded for easy and quick replacement. The AccuFlo is compatible with our latest handpiece, the ComfortGrip, which provides an easy grip. Ideal for long hours of work. The back of this handpiece sits loosely on the hose, putting the pivot point at the nozzle, which increases dexterity and limits hose drag. Click to access the list of available nozzle sizes and shapes. When might our Classic MicroBlaster be a better option? 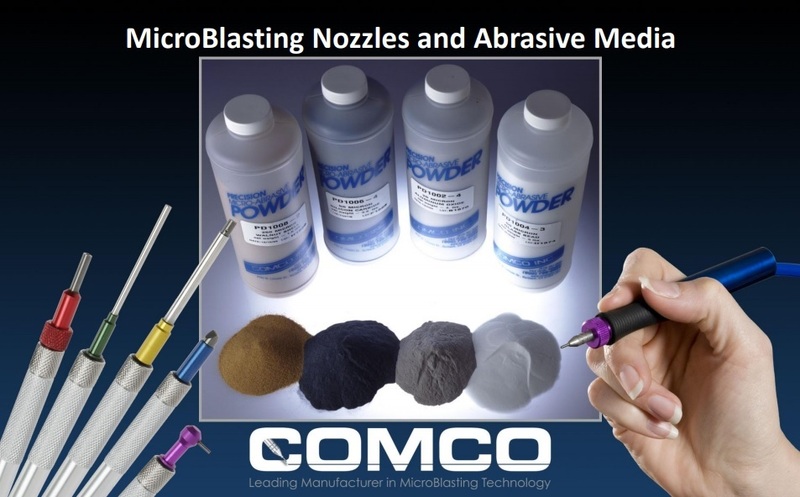 If the application requires a two-step process; the ideal option is our Dual Tank MicroBlaster® Model MB1002, which isolates each abrasive. Each tank runs on a common air supply using separate modulators and handpieces to avoid any potential for cross-contamination. 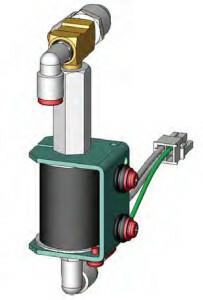 The operator can alternate between the two abrasives with the quick flip of a switch. 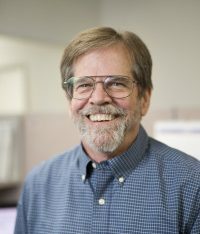 Email me or give me a call at 800-796-6626.